Use stencils to create a high-end look for less! Welcome back, Cutting Edge Stencil fans! Is there a drab wall in your home just itching for a DIY makeover? We have the perfect solution that won’t break the bank and will make your interior design dreams come true! 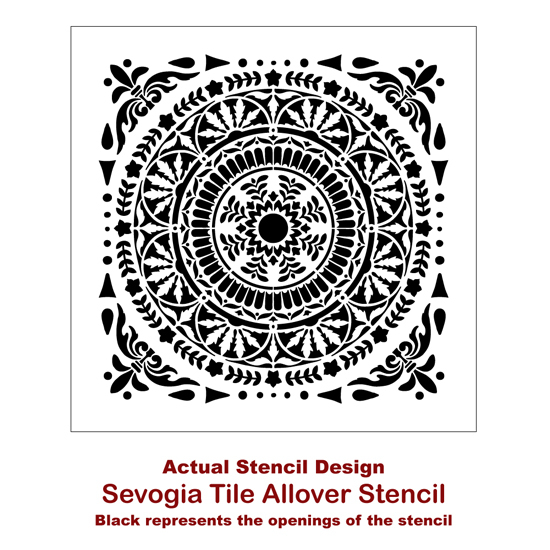 We would like to introduce you to our Segovia Tile Allover Stencil. Let’s just take a minute to appreciate the detail of this design that was inspired by Spanish majolica tiles and hand-painted ceramic tapas plates. It’s a perfect way to add a touch of Mediterranean inspired flair to any room. Erika started her project by painting her wall with Simply White by Benjamin Moore. Once she had a fresh, blank canvas to work with, she began to prep her Segovia Tile Stencil. When creating an allover look, we recommend using our clip-on stencil level from the start. Erika attached the level to the bottom of the stencil and sprayed the back side of the stencil with a reposition spray adhesive. We like Sticky Note repositionable spray adhesive. You could use any respositionable spray adhesive that is typically found in a craft store like Michaels. 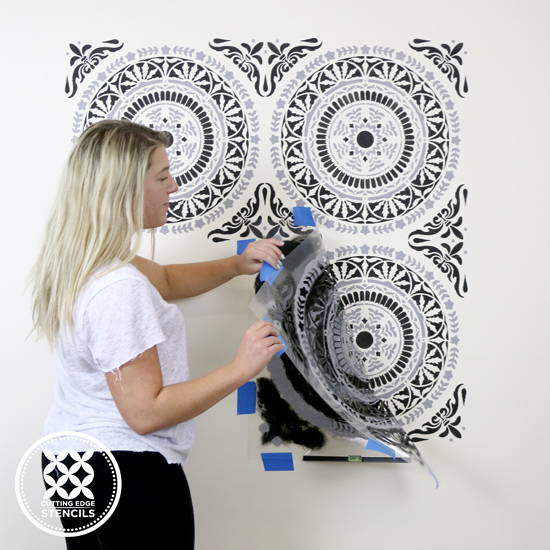 She taped the stencil to the wall, and of course, kept her eye on that level to make sure it was properly placed. Erika decided this Spanish design was just too beautiful for one color. She chose to go with Winter Grey by Benjamin Moore and Ben Moore Black paints. 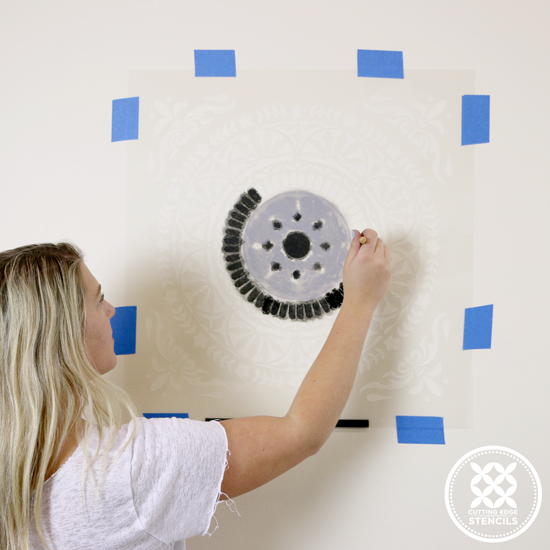 For multi-color projects, we recommend using our stencil brushes in order to have more control over your color placement. It’s important to have a paper towel handy and offload your stencil brush on to the paper towel to avoid using too much paint. Pro-Tip: less paint means clean lines. You want to use a stippling motion to fill in the stencil. 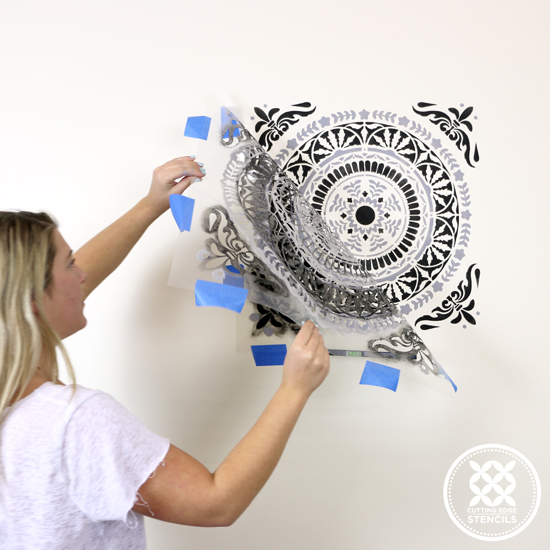 Erika started stenciling in the center of the Segovia Tile Stencil design, alternating her colors as she worked her way toward the edges of the design. Once the first section was complete, Erika peeled back the design. She aligned the stencil over the previously painted marks using our built-in registration system. 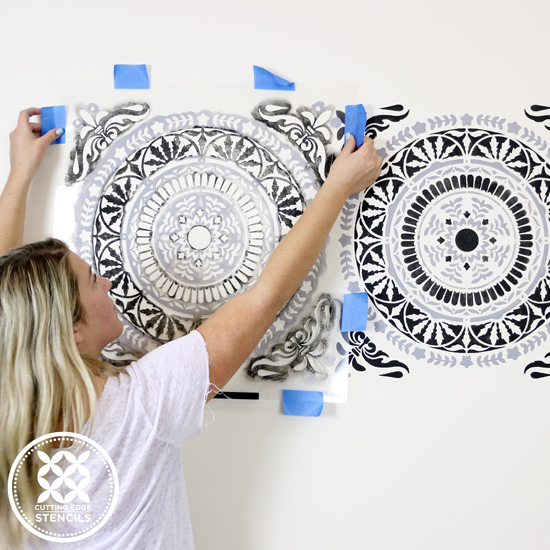 Erika repeated this process until she created a seamless, stenciled look that could totally pass as expensive wallpaper, but for a fraction of the price. Plus, you can take pride in knowing YOU created that gorgeous wall. She paired this delicately detailed pattern with some modern furnishings to complete the look. We could not be more in love with this fresh, new space! Tell us, which room in your home is ready for a stenciled update? We’d love to read your thoughts in the comments below. 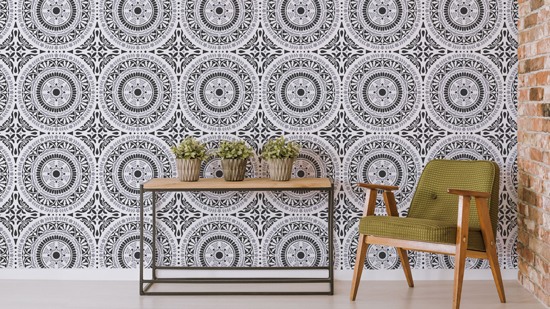 Shop our allover stencils and add style to your home today.